Panelists discuss the HBO documentary film The Oslo Diaries as well as the years of Israeli-Palestinian negotiations, the legacy of the agreements, and the future of the peace process. The documentary follows a group of Israelis and Palestinians as they meet in Oslo for unsanctioned peace talks during the 1990s in order to bring peace to the Middle East. HAASS: Well, good evening. That is a powerful film so I will stall for a minute or two. At the far end we have, again, Ghaith Al-Omari, who’s now at the Washington Institute—he was heavily involved in the subsequent negotiations; Martin Indyk, who was at the White House at the time, and I’m glad to say this is his first event here at the Council on Foreign Relations in his new capacity as a distinguished fellow at the Council on Foreign Relations. (Applause.) (Speaks in Hebrew)—as we say in the old country. HAASS: And next to me is a rigid military lawyer—(laughter)—also known as Joel Singer, who played such an instrumental part in the documentary and, more important, in the history. So let me thank all three of you. We’ll have a conversation for a few minutes. Then we’ll open it up. I just want to—Joel, I’m going to start with you, actually, on one thing, which is I just want to talk a little bit about the start of this process, because you weren’t there on day one—you came in afterwards. This is unlike anything I’ve ever been involved in in negotiations where you, basically, have two left-wing professors who go off and start this process. Say a little bit about how that happened. Like, did they cook it up? Did Yossi Beilin cook it up? What was the—what was the origin of this process and why in the world did the Palestinians meet with two Israeli professors who it was not clear had any authority to speak for anyone but themselves? SINGER: I have been aware of other such contacts for a long, long time. That was not the only event. There were many of those years before that and after that, and the PLO, I believe, used those two nice Israeli professors to send messages through them. They knew that they were associated with Yossi Beilin. Yossi Beilin was associated with Shimon Peres. Shimon Peres was associated with Yitzhak Rabin, even though they didn’t like one another. But they worked together. So they used them as a vehicle to send messages. They knew that there was nothing—nothing was going to happen with those two officers. But for all of you to understand, this agreement is called the Oslo agreement and not the Peres agreement or the Timbuktu agreement. By chance it just happened this way. There was nothing miracle in Oslo. They just happened to meet in Oslo and it just worked. HAASS: Martin, you were—you were at the White House then. How did you learn about—when and how did you learn about this and what was the American reaction? Because in my experience—I was your predecessor, if I remember correctly—and we were kind of used to running things, and the idea that we were going to be told about a major negotiation was not something Americans come naturally to us. I’m just curious—why don’t you say a little bit about that? INDYK: Well, first of all, I owe a special thanks to Richard for bringing me here up in this—on this podium in my new capacity and I’m very excited to be here finally at the Council on Foreign Relations in a scholarly capacity. So thank you, Richard, for that. Secondly, I have to say, I think Joel deserves the Academy Award for the best supporting actor in this—(laughter)—in this movie—by far, the most impressive. Look, it’s a complicated story. But the policy that Bill Clinton was pursuing—I was his Middle East advisor at the time—was Syria. We were trying to make a deal between Israel and Syria, and we heard about these professors in Oslo. Dan Kurtzer, who was in the documentary, had some relationship with Ron and Yair Hirschfeld and he was telling us from time to time about these professors in Oslo. But we didn’t take it seriously because, as you all said, they were just professors. 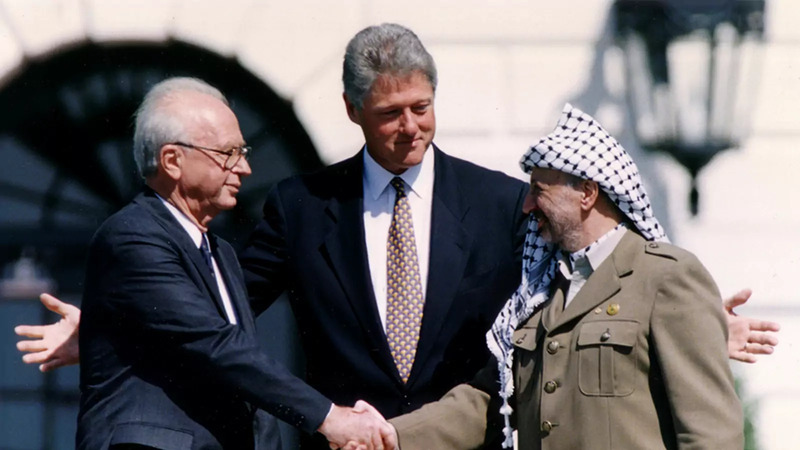 And, on the other hand, Rabin had given Clinton a deposit in his pocket of the Golan Heights. He said, that if my requirements are met for peace and security, I will agree to withdraw completely from the Golan Heights. So we had the makings of a deal, we thought, with the Syrians, and we had gone to Damascus in July, I believe it was, right at the time when the talks between Joel and Uri Savir were reaching a climax in Oslo with Warren Christopher and told us that his needs were being met in terms of withdrawal, if Rabin’s needs were met on peace and security, and we came back to Jerusalem and Rabin gave us a really hard time about it. He was kind of dismissive in his way. INDYK: —to finalize the deal and that good news from Damascus, even though there really wasn’t—Assad hadn't responded to Rabin’s offer in any positive way—was his way of pressuring him. And on the other hand, what we did not know was that Joel and Uri Savir had gone to Oslo. We had no idea of that. Had we known that, it would have changed our view completely. HAASS: Because it wouldn’t have just been two professors kind of doing their thing. INDYK: Right. It was official. PLO was talking to representatives of the government of Israel. At that time there was legislation which made it illegal for any U.S. government official to even shake hands with the PLO. You surely remember Andy Young had to—had to resign as U.S. ambassador to the U.N. because he dared to shake the hand of the PLO ambassador. So, you know, the idea that the representatives of Rabin were negotiating with the PLO was something that we just never imagined. So it was a complete surprise to us. Now, why weren’t we controlling it? Essentially, because Rabin knew that with all those laws that he couldn’t use us to deal with the PLO—that he’d had to do it, in effect, behind our backs and then bring it to us in the hope that we would support it. HAASS: But it’s also fair to say that the Madrid process by then had essentially run out of gas. INDYK: —who were negotiating in Washington and stopping them from doing anything because he had this deal going that we knew nothing about. HAASS: —on not dealing with the PLO. So we went through this elaborate fiction of dealing with non-PLO Palestinians who, obviously, Arafat still had the ability to vet. When did this become known in the—you were in Jordan at the time, correct? HAASS: Well, why weren’t you doing peace talks? HAASS: When this became—well, how did this become known in Jordan and the Arab world and with the Palestinians and what was the reaction? Was the feeling there is promise and potential and, wow, this has gone farther than we thought? Or was it the sense of, my God, these people are selling out and this—we’re not—we’re not getting nearly enough? What was the—what was the initial reaction to it? AL-OMARI: Both, actually. These were days before Twitter and what not. We, literally, woke up one morning, looked at the newspapers, and there we are—there’s a deal and it’s going to be signed. And immediately you started getting two reactions. One reaction, and you saw what—and you saw some remnants of it even with Hanan Ashrawi, saying, you sold out too much for the sake of, basically, being accepted by the Americans and the Israelis and what not, and this was, I’m going to say, the prevalent view among many of the intellectuals, activists, et cetera, et cetera. On the other hand, there was a sense of hope. I mean, you saw the images. You saw people in the West Bank and Gaza. There was a sense of excitement, and I remember, even for someone like myself, I was torn between the two. The kind of rational activist political actor wants to reject it, yet the sense that the public is behind it, the sense that also, frankly, hope, possibility—things that we thought were impossible—suddenly become possible. And, ultimately, I think, as we saw in reality, the sense of hope, the sense of change, the sense of possibility, triumph, and many of the rejectionists continued to reject. At the meantime, people in the West Bank, people in Gaza, even in the refugee camps, were excited because they felt that their lives are going to change. Maybe there was too much hope. Maybe it was unrealistic hope. But, certainly, that was the sentiment that was there, and if I may add here one point. I mean, this is—as I watch this, it’s a very painful show to watch. Yet, you end up—you know, it reminded me of that sense of hope, and today, I believe one of the most difficult things—you know, you talk to people, you can come up with interesting intelligent policy prescriptions. What you cannot come up with is how do you ignite a sense of hope for Palestinians, Israelis, and for young people on campuses here and elsewhere. So this is, I think, part of the—what—the genius of Oslo and part of the major deficit that we have today. HAASS: I want to come—circle back to that later. Then we’re going to spend a few minutes in a minute talking about why it didn’t work. But let’s—I’m going to be uncharacteristically positive for a minute—(laughter)—which is what’s the positive legacy? What’s the accomplishment? What did—what did Oslo reveal? What did—what legacy in a positive sense came from it? To the extent one wants to see the glass is half full, what can one take from it or glean from it about possibility or potential? I mean, you’ve written about—Joel, I’ve read your analyses of it, and before you go into all the reasons it didn’t work, you also, though—you spend a few minutes on some of the accomplishments. SINGER: First of all, it’s very important for everyone to understand that to accomplish peace, especially in the Middle East, you cannot use a stopwatch. You must use a calendar with a lot of years in it. Think about Israel and Syria. The peace process between Israel and Syria started at the end of the Yom Kippur War. At the end of 1973, the Geneva Convention with Henry Kissinger convened in Geneva, and we are now forty-five years later and we only have one element of it, and everyone understands because of the situation in Syria we need to wait many, many more years. And the difference between Israel and Syria, as Martin can testify, is approximately ten meters along the border. That’s all. Compare this to the Israeli-Palestinian conflict. It’s existential. It’s not about the border, certainly not about ten meters along the border. It’s about this party thinks that all of Palestine belongs to it and this party thinks that all of Palestine belongs to it, and what about the holy places and Jerusalem and the refugees? I mean, each of those issues can take decades to resolve. So I am saying don’t despair. It will happen. You just have to be patient. Look what was accomplished in Oslo—a mutual recognition agreement between two people that, before that, stated publicly the other people does not exist. Palestinians said there is no such thing as a Jewish people—it’s a religion. Israelis said—Golda Meir, the Israeli prime minister, said there is no such thing as a Palestinian people. Suddenly, you have mutual recognition, notwithstanding all the obstacles it still holds. And then Oslo created the foundation for future peace. Peace cannot and will not be built in one jump from where we are today to a permanent status agreement. Everyone who believes that this is doable lives, I don’t know, on the moon. You have to take it—the good foundation—with all the obstacles established in Oslo and build on it more and more layers and, over time, it can be done. HAASS: Martin, given what—the players at the time, given the context at the time, the question I have—it’s the one I’ve thought about a lot—is whether Oslo could have worked if only and if either different details or whether it was in some ways doomed to fail—that the prerequisites for success simply weren’t there, and what’s surprising is not that it didn’t succeed but that it went as far as it did. What’s your take? You were both a participant and an observer, simultaneously, and now you’ve got the advantage of twenty-five years of perspective. When you look back on it, what’s your—what’s your take on it? There’s nothing in the Oslo Accords about a Palestinian state. There’s nothing in the Oslo Accords about Jerusalem. There’s nothing in the Oslo Accords about settlements. And so it depended, and I thought, you know, Abu Alaa captured it perfectly. It was this trust was going to be the critical element and trust—that was the heart of the Oslo bargain. HAASS: Can I interrupt you there for a second? In order to say that’s the case, that you have to have—two things have to flow from that. One would be that time is, in some ways, working in your favor—that, over time, you can build trust rather than have to have time be something that tears away, and second of all, any interim agreement, whether it’s Oslo or the Middle East or any other part of the world—Cyprus and others—(might have failed ?) in any number of venues—one of the reasons you do it is you think it’s premature to get a final status agreement; that if you were to tackle all the issues you just listed, the gap between the two sides was simply too great and they couldn’t have succeeded. So, again, was Oslo the best that you could have hoped for? Or do you think, in retrospect, people should have been, in a funny sort of way, a more ambitious agreement might have been a more possible agreement? INDYK: No, I don’t—I don’t believe so. Joel, of course, was there so he knows what wasn’t possible. But I don’t think, from the outside, it was possible to deal with all of those final status issues—Jerusalem, refugees, and the Palestinian claim to right of return, and the borders, and—I mean, no, there was—there was no way. And that’s what Yossi Beilin kind of presented to Peres, the great dove, and Peres said it’s premature. It was premature. HAASS: Building what? I’m sorry. INDYK: —in the intentions of each towards the other, and that a gradual process of handing over territory and the Palestinians assuming control of territory would engender hope and trust and that would enable them to deal with the final status issues, and the problem with Oslo, from the outside, was that precisely because it didn’t deal effectively with the two trust-destroying issues, it didn’t work, and one was—and we saw it in the documentary—terrorism on the Palestinian side—not by Arafat in those early days but by the opponents—Hamas—who wanted to destroy it, and on the other side, the settlers, who saw this as a great threat to their ambitions and understood that there were several ways of dealing with it—number one, pushing to expand settlements, and on the other hand, the extremists among them using violence, first of all, with Baruch Goldstein to kill the Palestinians, which really put the process into cardiac arrest and then, of course, assassinating Rabin. And that combination really destroyed the trust on both sides and that left the Oslo process in a very vulnerable condition. HAASS: Ghaith, I want to come back to Arafat for a second because we know him not just through Oslo but subsequently, and the question I have, you know, in order for any peace agreement to work you need leaders who are, one, willing and, two, able to make peace, and one’s a question of disposition, ideology, what have you, and the other is a question of political position. And the question I have for you is whether Arafat, at that time or at any time in his career, was he somebody who could check both boxes—willing and able to make peace? AL-OMARI: I can very confidently answer the able. I certainly believe he was able. He had that political—I mean, he was almost the father of the nation, of modern Palestinian nationalism and recognized as such, and his ability to even sell Oslo with all of the concessions in it showed that he was able to do some very difficult decisions. Whether he was willing is actually one of the most difficult and I simply have no answer to. I mean, people who are—who were much closer to him than I ever was still will tell you this is the one thing that he would not actually show. If I were to guess, I would guess he himself did not know. I would guess this is one of these things that when you get to the moment, he will have to decide to be a combination of the substance, a combination of the timing, a combination of the political context. But truly, this is one of the biggest questions because you saw enough in his later career to believe that he had the intention and you saw enough to also believe that he did not have the intention. So I simply—there is simply no way of answering that question. HAASS: Joel, there’s a line towards the end of the film—I think it’s Saeb Erekat—who said when they assassinated Yitzhak Rabin they assassinated the peace process. Was he right? Was Rabin, in some ways, the only Israeli who had both the will and the ability? Some said Peres had the will but not the ability. Bibi may have had the ability but not the will. Was Yitzhak Rabin the only Israeli who had both? SINGER: I am confident in that Rabin was the only one—only Israeli leader who was able to do it, whatever it is, because—and I would say, just to be fair to Peres, the combination between Rabin and Peres together. Certainly, Peres alone could not have done it and he did—he was never able to be elected. Rabin was able to be elected but somehow—and they didn’t like one another but they learned to work together—and the combination between Rabin’s focus on security issues and his ability to project to the Israeli public that he is a trustworthy person, he could be elected, with Peres’ vision, I equated this once to this Rubik’s Cube—you know, the only combination—you know, Rabin and Peres—where suddenly you saw this cube has all the right colors on all sides. All the other combinations in Israel were just messy. HAASS: Martin, so here we are twenty-five years later—I want to pivot a little bit before I open it up to our members—which is we couldn’t make peace then, and over the last twenty-five years a lot has happened and it doesn’t necessarily increase the prospects among—several of you—I guess Joel, in his writing, you’ve publicly—you talked about settlements, the obstacles there. There’s a lot more violence that’s happened. Politically, Palestinians are, shall we say, fundamentally divided; Israel has moved to the right politically; and so forth. When we look back on all this, was—and it gets back—because Joel actually voiced some optimism, ultimate—but the question is, was this really the last best chance and what we have now is a much poorer—whatever metaphor once use, but much less to work with? INDYK: Yeah. We certainly have much less to work with. I had the melancholy responsibility to negotiate with the Israeli and Palestinian negotiating teams and with Secretary of State Kerry and President Obama a final status negotiation for nine months, which I believe was the denouement of the whole Israeli-Palestinian process for the time being. The parties—but I have to stipulate that John Kerry would not agree with this characterization—but my view of it is that the parties were actually further apart at the end of our negotiation than they were at the beginning, and I can go through all of that but it just demonstrated very clearly up front—up front and personally to me—just how broken this process has become, and you saw it at the end there that line about sixteen thousand Israelis and Palestinians have died since Oslo. And, you see, when you—just to go back to this trust building—when you try to build trust and you have commitments made by both sides, and both sides honor the commitments in the breach, and then the whole thing breaks down and explodes into the violence of the second intifada, and then so many people die, it’s no wonder that neither side believes that the other side wants peace. And the leaders—Abu Mazen and Bibi Netanyahu—just have a toxic relationship. And so, you know, you can’t get there from here. So Joel said it at the end, you know, not in his lifetime, perhaps not in his children’s lifetime. I thought that was a little excessively pessimistic. I don’t believe it’ll be in our lifetimes. But I do think that one of the benefits of Oslo—well, actually, there are two benefits—one is that we did end up—Israelis and Palestinians, with Americans as the mediators—did end up tackling on several important occasions—at Camp David, where Ghaith was present, and then subsequently including in the negotiations that I was involved in in 2014 all of the final status issues have been discussed in great detail. We, essentially, know what the deal looks like. The conditions do not exist today and I do not believe will exist for a long time to come for that deal to be made. But eventually, after both sides exhaust all the other possibilities and try their one-state solutions, they will come back to it because none of the other solutions actually resolve the conflict. Two-state solution is the only way that the conflict can get resolved. So we know what it looks like. We’ve seen the promised land. But, you know, it’s like Moses on Mount Nebo—he shall not cross into it. I don’t think we’ll have the chance to cross into it. But our children will. HAASS: Ghaith, I want to raise one last point with you before I open it up, because Martin said after all the alternatives have been tried. One of them is the single-state solution. Why don’t you say a little bit about the debate as people get disillusioned over the possibilities or the content of a two-state solution? Just say a little bit, because I don’t think there’s enough of a conversation in this country about this, about the Palestinian conversation now about the one-state alternative. AL-OMARI: Before I do this, I mean, if I may just—what Martin described—this trying everything and despairing and going back to a two-state solution—is, frankly, exactly what happened to Arafat and Rabin and to that generation. I mean, we tried everything. We tried to annihilate the other—violence, terrorism. We tried to conceptually deny the other—you know, the Golda Meir, the—there’s no Jewish people, et cetera, et cetera—and so sadly, I mean, part of history repeating itself is people have to make the same mistakes to reach the same conclusions. So in this one, I mean, I’m fully with Martin—there is no other option. What you see on the Palestinian side on the one-state, two-state is actually an interesting debate in the sense that there is certainly a growing disbelief in a two-state solution. There is a sense of failure, a sense you try and you try and try and you fail, and add to that a sense of a complete lack of trust not only with the other side, and there’s plenty of that, but with their own—with the Palestinians’ own leaders. I mean, you talked about the split between Hamas and Fatah. It’s deeper than that. When 80 percent of the Palestinians consistently, as polls show, believe that both their governments—Hamas and Fatah—are corrupt, it’s very hard to see how they have the credibility to go there. So what you have is, again, more and more people telling you that they prefer a two-state solution—it’s not going to happen because of the other side, because of our bad leaders—therefore, you know, it’s not going to happen in my lifetime. AL-OMARI: One-state solution—pardon me. And secondly—and I think this is something that is lost on many of the advocates of one-state idea in the West and partly in this country—that a one-state option for the Palestinians means the denial of Palestinian nationalism and Palestinian national aspirations. What the Palestinians have always wanted—this is the whole idea behind the PLO back in the ’60s, even Fatah in the ’50s—was a Palestinian state that has a Palestinian flag, that sings the Palestinian national anthem, that symbolizes that. A one-state option simply denies that, and you find it as such with very little traction among most Palestinians there. So what we have now is this—is this vacuum—a vacuum of one paradigm is losing credibility but no paradigm is filling it, and it’s a very dangerous, very fluid situation. But I don’t see the one-state crystallizing as a unifying concept around—along for the Palestinians. HAASS: That’s interesting. So often when we used to try to make peace in the Middle East and failed, we used to use the bicycle metaphor—that if you’re not moving forward you’re falling off. An alternative would be you may not be moving forward but there may be a long-term situation where you don’t go to the radical alternative of one-state, you can’t achieve two-state, and you have something in between that isn’t formalized but you work at—a version of the status quo but status quo plus in various ways. AL-OMARI: This is, I think, a point that Joel mentioned is that, look, if you go for the big one you’re going to fail, for reasons that Martin mentioned. There are a lot of options short of that that will show a sense of movement and a sense of progress, and I go back, if I may, to what I started with—the debate on the signing of Oslo where many people were, you know—the intellectuals were telling you this is deficient, blah, blah, blah, blah. When a people feel that their lives would be impacted in a positive way—maybe not the full thing but there is a process that will impact their life positively—they tend to support this process, and given many things that is happening right now on the ground, there is a space for some of these issues to create a sense of possibility for people and, frankly, to recreate a sense of partnership where you can, as a Palestinian, look at Israelis as people who are capable of doing good things for you and, as an Israeli, look at Palestinians as people who are capable of being partners on your side. So there’s a lot of small things. The challenge is do you get someone from the outside who will say, let’s be modest, let’s be realistic, but let’s be real, and move seriously, or are we, once again, going for these windmills again, trying to get this Promised Land that will not be achieved. HAASS: Joel, I’m going to ask you one last question before I open it up and I’m going to give you a chance to recant. Towards the end of the documentary—I scribbled the notes—you said, an opportunity like this comes once in a hundred years, and we wasted it. I want to ask you on both sides of that, do you think it’s that rare—once in a hundred years? And second of all, do you think you wasted it or it really wasn’t the opportunity you thought it was? SINGER: I still think that it was wasted. It was a real opportunity that was wasted and that one day it will come again. You need two things to happen and to happen at the same time. As Martin said, the plan is there. All the details are known. Two things must happen, and I’ll start with the Palestinian side—I could have started with the Israeli side. On the Palestinian side, a leader that can stand against the Hamas and any other opposition organization and tell them, this is it—I’m going to do it, and if you don’t agree, I will fight you and get rid of you in a forceful if necessary manner and be successful in doing that, rather than being defeated. Remember what happened in Gaza after Israel withdrew. Hamas took over. Something like this will happen in the West Bank if Israel withdraws. To allow Israel to withdraw there should be a Palestinian leader that can stand there and prevent all the Palestinian opposition forces from defeating him. On the Israeli side, you must have a leader that can stand against the Israeli opposition that now looks like the majority but this should change, and be able to evacuate all the Israeli settlers from the West Bank and do it in a successful manner and be able to draw a border and take them out and fight anyone that would want to try to prevent it. And those two leaders must emerge at the same time. (Laughter.) So I used one hundred years. Well, you know, I will give you a concession—a concession. HAASS: (Laughter.) I would have said—the simultaneity is actually an important point. If you think about South Africa, Mandela and de Klerk, in a funny sort of way, were stunningly fortunate they were there at the same time. Mandela alone could not have delivered a peaceful transition and de Klerk alone could not have delivered it. It took both, and it was the pairing that was so critical, and you have to be heavily on the fortunate side of history to have that degree of simultaneity. I’ve got time for a few questions. Sure. Wait for—I’m sorry—wait for the microphone, introduce yourselves, and we might run about five minutes over because we started a few minutes late. I just give you warning in advance. But there’s a treat waiting for you afterwards, which I will announce. So go ahead. Q: Listen, I’m Ron Tiersky from Amherst College. Q: So how—what should the question be—are you not too, I don't know, weak—you understand what I mean—in thinking about how this can resolve and what the time frame is? HAASS: Yeah. Let me just sort of slightly rephrase part of it, which is does the evolving context in the Middle East—in the broader Middle East—does it make it tougher or better for would-be peacemakers. SINGER: Well, if you look around, you have more and more reasons to reach peace sooner. But at the same time, you have more and more difficulties accumulating. So—and it happens simultaneously. And, you know, maybe something that could have occurred twenty years ago it’s now much more difficult. It’s easier because, as Martin said, we now know the details. All that you need is a signature. But in order to sign, you need to get rid of the difficulties and a lot of them are internal difficulties for both sides. The Hamas is now much stronger than it used to be. There are many more Israeli settlements in the West Bank to evacuate. Do you know how many settlers were in 1993 when we reached the Oslo agreement? One hundred thousand. Now there are north of four hundred thousand and growing. So there are more and more difficulties. INDYK: I’d also add, just quickly—Israel is getting the benefit of that growing recognition and acceptance in the Arab world, which started with Egypt and the Israel-Egypt peace treaty and has advanced all of this time in which we’ve been talking about. The travails with the Palestinians, the relations with the Arab states, particularly the Sunni Arab states, has grown and developed and stopped. Not revolution, not the Arab Springs, nothing. It all moved forward to the point where they now have very strong common interest in combating Iran. But, in a sense, that has hurt the chances for peace—it hasn’t helped it—because Israel has gained the benefit of that without having to make the deal with the Palestinians. In effect, the Arabs have abandoned the Palestinians, for all intents and purposes. So there’s no pressure on Israel coming from the Arab states to make this very painful and difficult deal with the Palestinians. HAASS: I want to get the editor and book publisher in that back row there. Q: I’m Warren Bass from Penguin Press. One of the key ingredients seemed to be—that made Oslo work was the emergence of a strong and tough Israeli left that was in power. The Israeli left now is a ghost of its former self. Is there any way to revive an Israeli left other than an additional Palestinian intifada? Q: Or would that do it. SINGER: Is this a question to me? SINGER: Yeah. Well, the two theories about Palestinian violence—does it make peace come closer or get—you know, the peace go away—some people would say but for the first intifada there would have been no Oslo. Others would say but for the second Palestinian intifada there could have been a permanent status agreement. I am not a good judge on this. I’m not sure that my judgment will be necessarily completely objective. But I believe that it is a prerequisite for peace to avoid—for the Palestinian leader to control violence against Israel because I think that the Israeli left, the majority in Israel in those days, disappeared because of the Palestinian violence. There were always people in Israel that objected to the Oslo agreement because they felt that Israel should not leave the ancient Holy Land. But the majority of Israelis—the left, center left—were for it because they felt that this will bring peace. What they saw is that as Israel progresses there is more and more violence so they became rightist. Q: Yeah. Raghida Dergham. Can you hear me? HAASS: Can’t hear you. Speak into the microphone. Usually it works if you speak right into it. Q: Yes. Raghida Dergham here. Q: OK. My name is Raghida Dergham. I’m chairman of Beirut Institute. So in the movie—in the documentary, Abu Mazen—Mahmoud Abbas, the president of Palestine—is mentioned a couple of times. Now, as someone who was engaged in the negotiations or in the talks, I’d like you to elaborate on how involved was he, because my information is that he was incredibly involved from the very beginning. Abu Alaa and Abu Mazen were very much at the forefront of this process. And I—the reason I would like to—and, Richard, your opinion matters on this one—so then we saw that Mahmoud Abbas, at least from the film, was the one engaged in the Oslo process, whereas Bibi Netanyahu was against it. So now we have—you know, we have that—you know, that two—the people who may make peace as opponents. But Mahmoud Abbas, the other day here in the General Assembly, spoke of options, including a security option. Which means he was hinting at the potential of disengaging with the Oslo process, meaning that he will dissolve the Palestinian Authority, which is providing security on behalf of Israel in the West Bank. What would happen then? HAASS: Well, actually, I’ll just venture a little bit the latter one, and it’s a paraphrase of what Joel said—if you want peace, I think you have to make peace. The idea that peace is going to grow out of violent resistance I don’t see that happening and I think it will push Israeli society to the—politics to the right. It’ll create more statistics on both sides, and by and large, as we’ve seen in things that begin to take on the characteristics of civil war, the Thomas Jeffersons of various societies tend not to come to the forefront in civil wars. It’s not good for peacemaking. So the idea that the Palestinians will come closer to achieving their goals through violence I think would be a seriously flawed and actually tragic approach. So to walk away from security responsibilities, no. Again, I think what you want to do, if anything, is increase your capacity to maintain security, not threaten the Israelis with greater insecurity. AL-OMARI: But if I may—sorry. AL-OMARI: I mean, just two points here. I mean, on the Abu Alaa-Abu Mazen thing, by the way, their relationship was as complex as the Peres-Rabin relationship. They don’t particularly like one another politically yet they are indispensable for one another. Abu Mazen was very much part of running it in the back office. Part of his, frankly, I think, resentment is much of the credit goes to Abu Alaa. So, I mean, by the way, this is part of what I found a bit, how shall I say it, maybe irritating in the documentary is there wasn’t much of an exposure of some of the dynamics on the Palestinian side. But to the point that, actually, Richard made, you called what the Palestinians are doing as giving security services to Israel. I would beg to differ in the sense that what we’re seeing right now—the security cooperation, the professionalization of the Palestinian Security Services—has created a sense of partnership that is much more solid than what we had in the ’90s. I mean, to Warren’s point, peace that was made between the left’s based on fluffy nice warm feelings dissipated when the fluffy feelings no longer are there. Today, you have a partnership based on parity between, frankly, very hardened people on both sides and I think if I would look at how the security—you know, the security cooperation—first of all, how do you build on it, because it’s created the new opportunities, and how do you replicate it. One of the lessons from Oslo is if you want to build a partnership, build it on primarily sense of mutual interest and see what matters for both sides. For the Israelis, it’s security at the core. And so here, you know, for someone like Joel, I think, shows that the Palestinians are serious. You might end up having a new peace camp that is not necessarily leftist, but equally committed. INDYK: I think—if I could just add to this—that is a lasting positive legacy of Oslo—you’ve written this—the security cooperation alongside the building of Palestinian institutions. But it’s only in the West Bank, so you’ve got the problem of Gaza doesn’t exist. But when it comes to Abu Mazen and his hinting that he might dissolve the Palestinian Authority, I strongly believe he will never ever do that. I’ll tell you a quick anecdote. On the last night—the last meeting I had with him after the negotiations had collapsed in 2014, and he was furious with Netanyahu for not giving—not fulfilling the commitment to give back the last tranche of prisoners, he said to me—he was really angry and he said to me, get me a meeting with Netanyahu tonight—I want to meet him tonight—I want to give him the keys—I’ve had it with this F-ing Palestinian Authority—I don’t want it anymore—he can take it. And he sounded pretty convincing—(laughter)—and I went back and told the Israelis—Netanyahu’s close aides—this time I think he’s serious, and they blanched. They were not happy with the idea that he would actually collapse the Palestinian Authority. And I thought for a moment there maybe he had something. Maybe this would be the—you know, the magic formula to force the Israelis to confront what the occupation actually means if they have to go back and take control of two and a half million Palestinians, which is now being handled by the Palestinian Authority. Clearly, the army doesn’t want to do that. Clearly, the Israeli army values the partnership with the security—Palestinian Security Services. But that is Abu Mazen’s one achievement from Oslo. He opposed the intifada. He opposes the use of violence. To, in effect, allow this—institutions to collapse willfully and for violence to break out again would be to destroy the one thing that’s left of his legacy, and I just don’t believe he’s going to do it. AL-OMARI: It’s only his legacy. This is a lesson the Palestinians learned throughout their history. If you are in someone else’s territory, not in control of your territory and your people, you are very vulnerable. Their experience in Jordan in 1970, in Lebanon in the civil war, and even in Tunisia towards the end had taught them that you lose this, you, basically, run the risk of collapsing as a national movement. So I’m not sure that he is serious with this kind of threat. HAASS: OK. We’re running way over. I’ve got time for one last one, and then I apologize. Q: Thank you, Richard. First of all, an observation. Daniel Arbess. The most relevant two facts that we heard tonight, I think, were the first statement by Abu Alaa in the film, in which he said, we entered the process because we knew that we had to take back the pre-’67 borders incrementally—we couldn’t have it all at one time—so we were going to do that. In the meantime, Bibi Netanyahu, who was elected in ’96, with facts on the ground and you, Mr. Singer, pointed out, we’re going to have half a million Jews living outside, primarily outside the green line. So it would seem that after twenty-five years Oslo is in trouble. Now, Martin, you and Richard know that I spent five days with Abu Mazen and Erekat and Majid Faraj beginning January 2 of last year, and I’m telling you I saw it in his eyes Abu Mazen would have gone for—I pulled a Joel Singer in that conversation using completely different language and no reference to history—he was about to go for Naftali Bennett’s plan with one major change and that is Palestinian law applying throughout the West Bank. In every other respect, he signed up to Abu Mazen’s plan until to—sorry, Naftali Bennett’s plan, which I won’t go into—until Saeb Erekat cut it off. Saeb Erekat, Mr. Al-Omari, is, clearly, given up and looks forward to taking Israeli citizenship. So my question for you to think about as we end tonight—and thank you, Richard—can we look to a future that balances one-state, notwithstanding your reservations, with democratic and human rights for Palestinians, legitimacy and local self-determination for Palestinians in a constitutional arrangement that preserves the Jewish character of the Jewish homeland? HAASS: Just say why you think it would be eternal war. SINGER: Because history has proven that you have two peoples with the separate narratives and separate dreams and separate desires that don’t—you cannot accomplish them together because on many aspects they are just contradictory. The only way is to separate and let each people live up its separate dream. So I would say go for the difficult solution that would hold rather than for the easy solution that would guarantee eternal war. INDYK: You know, Daniel, if you—if you want to pursue the solution that you started to outline, you should be in favor of a negotiation with Hamas. Israel should negotiate with Hamas. Hamas doesn’t want a final agreement. It doesn’t want to settle with Israel. Doesn’t want to recognize Israel’s right to exist. But it’s happy to have a long-term ceasefire or autonomy and build up its autonomous would-be state in Gaza. The deal could be much easy—more easily done with Hamas. But, as Joel suggests, it won’t resolve the conflict. Q: (Inaudible)—and the polls don’t even suggest that. The Palestinians would enjoy living in Israel. They’d have a much better (deal ?) than anywhere else in the Muslim world. HAASS: But you get the last word. AL-OMARI: —agree with. I mean, if they had such a wonderful life, why was there a resistance to the occupation since 1967? If that’s a wonderful life, why was there a rejection of limited self-rule in the ’70s, ’80s, and all of that? There is, ultimately—it goes back to what Joel said—there is a sense of a need for self-determination. You know, the small detail—that he wants Bennett’s plan except with Palestinian law—is not a small detail. It’s a question of whose primacy is going to be in that particular state—is it going to be a Jewish state or a Palestinian state—and that is no small matter. That is much more complicated than Jerusalem refugees and the borders. HAASS: So let me just say a couple things. One is I want to thank these three people for—(applause)—I’m a great believer in scholar practitioners. It’s what we try to bring here for Fellows and events because I love the combination of people who have the perspective yet also have the scars, and that’s what you’ve—plus some pretty good war stories. (Laughter.) So that’s what we’ve had tonight. So I really want to thank you, both for what you’ve done over the years but also for tonight. I want to thank HBO for their serious commitment to filmmaking, to Richard Plepler in particular, and as a reward, though, Joel has actually disappointed me only once tonight. I said, what is the story behind the waffles, and he said he didn’t know. But the story is that one of the regular ways the negotiators across the table would sometimes relax and unwind would be after an arduous day or evening they would have some waffles with various toppings and the like. So we have tried to create that across the hall. (Laughter.) So we will have an Oslo like desert.